Even though people all over the world do. Basil’s one of the foods you’re used to having on pizza or in a pesto, but the truth about basil is it’s much more than just a tasty garnish. It’s actually health food superstar. Then again, do I write much on foods that aren’t? Yes, basil is an amazing plant. And, since it grows both inside and outside with ease, tastes great, and is very potent, then there’s not really any reason to ignore it. Seriously, once you see just how good it is for your health then you might find yourself becoming a basilholic, which is obviously a word I just made up. Check out these amazing facts below. 1 – Enhances your liver’s ability to detoxify: Detoxification is a misunderstood and under-appreciated function leading to better health. Some people place far too much importance on detox; but it does pay dividends to do what you can to eat foods which support liver function. As you might have guessed, clever reader, basil promotes healthy liver function. Best of all, it can help your liver perform better in a short amount of time. This led to better health and a better ability to detox effectively. 2 – Acts as an adaptogen and fights negative affects of stress: I’ve written about adaptogens before. They’re herbs which work on the cellular level to help protect cells from stress. Basil is an adaptogen which means consuming it can help your body deal with stress and “shed the harmful effects of stress” on the body. 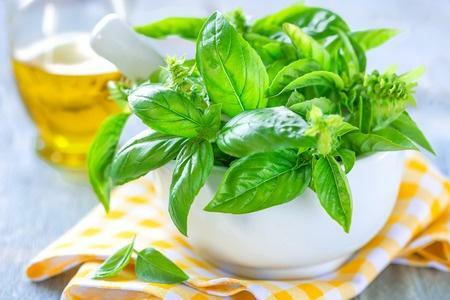 A study on basil and its anti-stress effects was conducted on lab animals and the findings were quite encouraging. Pretty amazing for something you never think much about. 3 – It’s a powerful antioxidant: Antioxidant activity is always something to look out for in plant matter, and basil offers unique antioxidant properties to help fight conditions resulting from free-radical damage. The two antioxidants powering basil are orientin and viceninare. Both of these are helpful to keep white blood cells safe from damage while also helping protect your DNA from radiation and oxygen damage. The antioxidants work to protect your chromosomes from damage, which can produce random mutations and eventual cancer growth. 4 – It’s a known anti-inflammatory: This is a big reason to start including basil in your diet. Inflammation is certainly a problem for many people, and it can lead to serious health conditions. Basil’s antioxidant properties mean it’s a capable fighter of inflammation. Basil contains a compound called eugenol, and it’s an effective anti-inflammatory. It works to fight inflammation by blocking an enzyme called called cyclooxygenase (COX). This is what qualifies it to receive this classification. The interesting thing is many popular over-the-counter medications work to block the same enzyme: products like aspirin, ibuprofen, and acetaminophen. It’s just that basil is able to do it without the side effects. 5 – It’s anti-bacterial: It’s well known the oil produced from basil can help keep dangerous bacteria at bay. What’s encouraging is, not just that it can fight bacteria, but it’s able to fight bacteria that have otherwise grown immune to many of the antibiotics being used in the treatment of common infections, otherwise known as super-bugs. Then there’s the study from Food Microbiology which showed washing foods in water with just 1% basil oil by volume can help reduce the presence of a common bacteria called Shigella. It’s also been seen to fight yeasts, molds, and viruses which make it a great addition to a garden or a personal hygiene regimen. 6 – It can help keep your heart healthy: High blood pressure and poor heart health are some of the biggest contributing factors to early death in the U.S. Basil can work to help prevent these common maladies from ever becoming a reality in your life. The health benefits of basil here are quite encouraging, as it can work to improve the function of muscles around the heart to contract and relax. Another reason it’s effective at promoting cardiovascular health is because it’s rich in the beta-carotene form of Vitamin A.
Beta-carotene has a positive affect on the epithelial cells because it keeps them from succumbing to free-radical damage. It’ll also prevent cholesterol from oxidizing, which is the only time cholesterol will begin to build up in blood vessels and pose a real threat. It’s also rich in magnesium, which is absolutely essential in healthy cardiovascular health as it is responsible for the contraction and relaxation of the muscles that send blood through the body. And lastly, it’s got several other nutrients responsible for optimal cardiovascular health which include Omega-3 fatty acids, Vitamin-C, copper, calcium, folate, and iron. As you can see, basil’s a great herb to have in the kitchen or at home. If you can’t grow it (it’s really not that hard, just YouTube a video on growing it outside or inside), you can also use basil essential oil for a great affect. It won’t work for culinary purposes, but it can definitely be used for other purposes (like those mentioned in this article). At the end of the day, basil’s something you really shouldn’t slouch on.